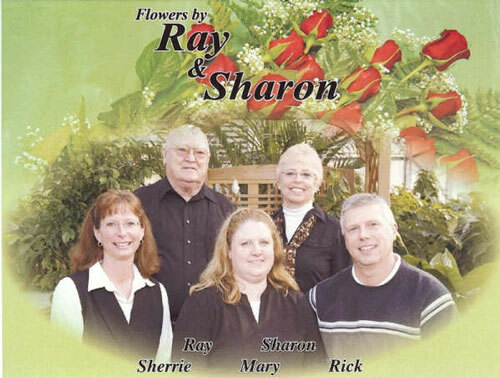 Flowers by Ray & Sharon has been family owned and operated for over 40 years. Our superb quality of flowers, creative designs, and professional services have attributed to our success and made us one of the top 200 florists in the U.S. With an experienced staff, two convenient store locations, six greenhouses, and a fleet of six delivery vans, we are always prepared to service your requests six days a week. We specialize in fresh and silk floral designs to fit any occasion - or no occasion at all! We are Muskegon, Michigan's largest full-service florist. Our commitment to quality and 100% customer satisfaction have made us Muskegon's #1 choice for flowers and Michigan Retail Florist of the Year! Specialty services provided by Flowers by Ray & Sharon, Inc. If you have any questions or need more information, please contact us by e-mail at randsflowers@aol.com or call us directly at 231-777-1512. We're always here to serve you and make your flower-sending experience a pleasure. Our shop serves the following areas: Muskegon, North Muskegon and Norton Shores. We also deliver flowers to the following facilities: Clock Funeral Homes (Muskegon, Fruitport, Whitehall and Grand Haven facilities, Ever Rest Funeral Home, Lee's Funeral Home, Pachesny-Jend Funeral Home, Reynolds Funeral Home, Klaassen Funeral Home, Sytsema Funeral Home, Walburn-Sytsema Funeral Home, Throops Funeral Home, Toombs Funeral Home, Vanzantwick-Bartels-Kamerad Funeral Home and Youngs Funeral Home. We also deliver to the following hospitals, Mercy General - Sherman Campus, Mercy General - Oak Campus and Hackley Hospital.